Gabby St. Claire is extremely excited about the upcoming school play. She and her best friend are determined to make the most of it, even though the high school kids will likely get all the big roles. They just want the chance to be in the show. But it seems like someone, or something, is trying to make sure the show does not go on. Could it be a student or a teacher trying to sabotage the show? Or is it a ghost? Gabby decides to get to the bottom of it and save the show. 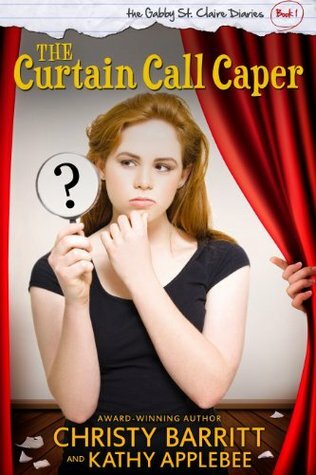 The Curtain Call Caper by Christy Barritt and Kathy Applebee is a spin-off of Barritt’s adult Squeaky Clean Mysteries series about crime scene cleaner Gabby St. Claire. I haven't read that series, but I will definitely check it out. Gabby is an interesting character, at least when she's in middle school. It would be fun to see what she's like as an adult! A bit of a klutz, Gabby is a kind girl and a good friend. Unfortunately, she has to deal with middle grade cliques and all the challenges that go along with that, but the story doesn't get too serious. It has a pretty good upbeat feeling throughout. There are plenty of characters to look up to, both kids and adults. And the mystery of why spotlights are dropping and scripts are missing is engaging. Overall, this was a fun middle grade mystery that should appeal to late elementary and early middle school readers. There's nothing too heavy or objectionable in this one. And there's a free novel study pack available for teachers and homeschoolers, if you want to add it to your curriculum! This review was written based on a copy of The Curtain Call Caper that I received from the author in exchange for an honest review. This review includes Amazon affiliate links.